Stalin had risen in the party to the position of one of its recognized leaders thanks, in large measure, to Lenin’s support. Lenin personally endorsed or suggested each step of Stalin’s accumulation of power both before and after the revolution of 1917. 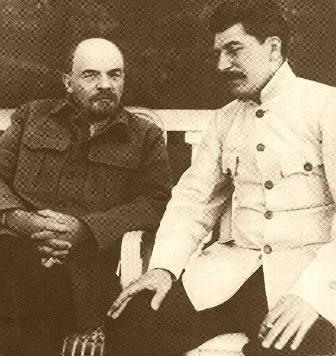 Stalin seemed to Lenin to encapsulate all the qualities of a professional revolutionary. He was a good organizer and was well trained in conspiratorial technique. After the revolution, Stalin was made Commissar for Nationalities, and in 1919, Commissar for the Workers’ and Peasant Inspection, a body that was supposed to ensure public accountability by closely scrutinizing all activities of departments of government. He was, simultaneously, a member of the Community Party’s Central Committee and of its policy-making Politburo. While Lenin was alive, the Bolshevik regime was characterized by oligarchic rule within the framework of a ruling party. The Communist Party did monopolize power and suppress its rivals, including other socialist parties, but within the party, with Lenin at its head, there was open controversy, debate, and compromise. The main levers of power were in the hands of the so-called Bolshevik old guard: approximately 10,000 party members who had joined the party before the October Revolution. The “Bolshevik guard” included many professional revolutionaries with considerable political experience. Sometimes they proposed different solutions to arising problems, which often led to the creation of factions within the party. The inner party contradictions of conflicting policies and personal ambitions were reconciled thanks to the integrating role of the top oligarch, Lenin. As a leader with great personal authority, Lenin had his way on many policy issues. However, on some questions he suffered defeat and saw himself obliged to accept the views of the majority. In a word, early Bolshevism contained an element of pluralism and was more an oligarchy than a personal dictatorship. Originally, all major issues were discussed and resolved by the party’s Central Committee. As long as the Central Committee membership was only ten or twenty persons, this practice was realistic. But as party membership grew, the Central Committee expanded and was no longer able to function as before. Consequently, the Politburo and the Orgburo (Organization Bureau) were created to guide the party during the intervals between Central Committee plenums. Gradually, these organs assumed absolute power while the power of the larger body—the Central Committee—diminished. The Politburo and Orgburo formed the inner core of the party leadership alongside one more important body—the Secretariat of the Central Committee. Initially, it had a subordinate role of providing organizational and technical support for the work of the Central Committee. The activities of the Secretariat were directed by a number of party officials known as secretaries, while its head was referred to as first secretary. In March 1922 Stalin was proposed for a job in the Secretariat. By that time Stalin had attained important standing in the leadership and enjoyed a reputation as one of the party’s preeminent organizers. To reflect Stalin’s stature, the post of the head of the Central Committee was renamed general secretary instead of first secretary. In his new post Stalin was able to exert greater influence on the agenda of the Politburo meetings and the wording of its resolutions, because their drafts were prepared inside the Secretariat. In addition, he was able to control the recruitment of the ruling elite, overseeing the placement and promotion of all responsible party officials.